Glossophobia — The fear of public speaking, a phenomenon that affects people all around the world. It’s the cause of many late nights trying desperately to memorize cue cards before a big speech. It’s the root of trembling hands and stuttering words behind a podium. However, not letting glossophobia take over my life is the very thing that changed it, making me a more confident person, and an increasingly active citizen. But how can that be? 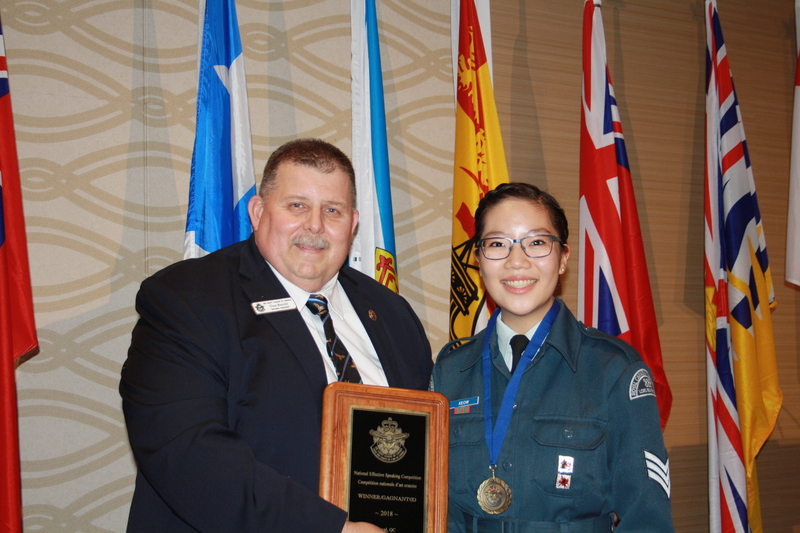 How can confronting a fear that frequently makes Top Ten lists around the world have such a positive impact on myself, and on cadets all across Canada? To figure that out, let’s take a trip down memory lane, back to my very first Effective Speaking Competition. It was March of 2016, and I stared out at the small crowd in front of me. As I held my speech between trembling hands, I scanned the title printed on the very first page: 100 Years of Women’s Right to Vote. Weeks of research and dedication had gone into that five-and-a-half minute speech, and I didn’t realize it at the time, but I would remember the facts and beliefs written on those pages even to this day. By writing about the suffrage movement, I suddenly felt proud and empowered as a young Canadian women to stand up there and advocate for it. That feeling was unique to the speech I was performing, but the raw emotion and conviction I delivered with it was something that I hadn’t felt before that day. It was something that the Effective Speaking Program had instilled within me, and I’ve made sure to include that undiluted feeling in every speech I’ve delivered since. Over the past couple of years, I’ve become a better leader, a more outgoing person and a compelling communicator in front of a crowd. Through National Effective Speaking Competitions, I’ve travelled all cross Canada, from Winnipeg to Montreal, learning new skills and meeting other influential young Canadians. The bonds that we’ve created over the course of five days are comparable to friendships that I’ve had all my life. The National Effective Speaking Program has definitely changed me for the better. I went from an uncertain Leading Air Cadet who was advocating for an issue that I believed in, to a two-time National competitor and eventual 2018 National Winner at only the rank of Sergeant. Anyone can be an Effective Speaker. It doesn’t matter if you’ve been a public speaker all your life, or if even the thought of speaking in front of a crowd terrifies you. It’s worth it to put yourself behind a podium and step outside of your comfort zone, because the opportunities and experiences that you gain from this program can’t be compared to anything else in the world. Every speech is like a story, a glimpse into someone’s thoughts and beliefs. Tell your own story, and let everyone hear your voice. I spoke up, and it worked for me. Let’s see if it’ll work for you too. Watch all the speeches of the 2018 National Effective Speaking Competition by clicking here or the video below. You can also select a competitor’s name to watch one of their speeches. Watch all the speeches of the 2017 National Effective Speaking Competition by clicking here.